There is a place in Africa where heaven reaches down to touch the earth. The stars shine brighter, the winds smell sweeter, and the people smile to gladden your heart. And the people dance, as their ancestors danced, in the dust till the dust flies round their feet. The story of this dancing troupe is one that feeds the soul. It is a story of inspiration, talent and hard work that took humble people living close to the earth to reach for the stars and compete successfully in local and international dancing contests. In similar fashion, the Riel is a traditional dance that has been passed down through many generations. It is recognised as the oldest dance form in South Africa, and is possibly the oldest in the world. Born out of the ancient Khoi and San rituals that were performed around their outdoor fires, the Riel is today a popular expression of local culture. The Riel is a high-energy dance involving frenetic footwork and is performed with lots of bravado, showmanship and foot-stomping after the Khoi and San’s way of celebrating a good hunt or a joyous occasion. Other Riel dances include vigorous courtship rituals, and mimicking the antics of local animals —baboons, ostriches, snakes and meerkat. Dances are performed on the bare earth, stirring the dust to swirl round their feet. Riel dancers are dressed in eye-catching farm worker outfits—the girls in dresses with aprons and doeke (head scarves), and the boys in waistcoats or braces and hats sporting jaunty ostrich feathers. Signature red veldskoene (field shoes) that are hand-made locally, complete their couture. The troupe was formed in 2012. They have been trained and their dances choreographed by their inspirational leader, Floris Smith, himself an ex-professional dancer, and at the time executive chef at the local lodge Bushmanskloof, which provided generous funding for their activities. The dancers are accompanied by several local and legendary musicians whose catchy lyrics, singing and instrumental playing have contributed enormously to the Trappers’ overall success. And their success has been phenomenal. From their first competitive performances in 2012 to current times, they have been recognised as outstanding with a long list of awards and accolades on local, national and international platforms. Scores of individual and group dance and instrumental awards have been heaped on them by the ATKV, (Afrikaans Taal en Kultuur Vereeniging, or “Afrikaans Language and Culture Organisation”), as well as several from the South African Championship of Performing Arts body. The National Department of Sport and Cultural Affairs awarded them for their contribution to arts and culture, and for their promotion of an indigenous art form. They made their winning debut on the national stage in SA when they were crowned as the Junior ATKV Riel Dance Champions in 2013, going on to win the top spot in the under-18 category in 2014. That year Floris was awarded the trophy for Most Dynamic Leader in the ATKV Riel Dance finals. They won the Grand Champion Award for “Best Group Performance”, as well as the gold medal in the “Ethnic Folk Dance” category in the South African Championships of the Performing Arts 2014, which qualified them to represent South Africa at the World Championships of the Performing Arts in 2015 in Los Angeles. Hailing from rural, impoverished villages, few of the youngsters had been out of the Cederberg, never mind to a city or out of the country, before they started performing with the troupe. Their journey has been a long one, full of challenges. “We had to find nearly R1 million in funding but the real mission was dealing with all the red tape in sending 17 teenage dancers and the band to the States,” said Floris. Fortunately Bushmans Kloof and its owners, the Tollman Family, were hugely supportive, while other major sponsors include Rooibos Limited, WESGRO and Reagola IT Management. The GrasKoue Trappers achieved stardom by winning numerous awards—four Gold, six Silver and one Bronze, and secured global recognition through their success at the World Championships in America. The team spent two weeks in Longbeach California, competing against performers from 50 different countries. Floris has big aspirations for the troupe and constantly strives to create more opportunities that encourage children to work hard and strive for better. The success of the troupe has truly been a team effort with amazing community support, not just from the community of Wuppertal and the sponsors, but from people from all walks of life. One such individual has been Elsa Perez, an 83-year old South African dancer that resides in London. Last year, a film, Get Riel, was made featuring Perez and South African Riel Dancing. It was composed of footage of Perez dancing and footage sent through by the Clanwilliam Riel Dancers. The film was entered into the Bristol Film Festival where it was voted third for the audience’s choice. Last month, the producers entered it into a film festival in Holland, where we were shortlisted for best feature. Unfortunately, it didn’t win but it was very well-received. In August Perez returned to South Africa to film a feature in Clanwilliam, where the Riel Dancers live in very impoverished communities. The screenplay was written, produced, and directed by Moira Rowan and filmed by Pablo Pinedo, an award-winning cinematographer for his film “Noma”. 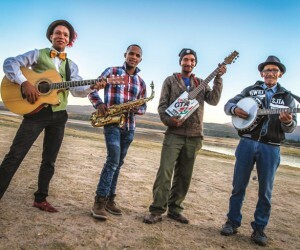 After spending several days filming in various locations in Clanwilliam, a concert was arranged at Floris Restaurant, inviting tourists from guest houses to attend and the business owners themselves. Elsa performed two dances and the riel dancers performed their three winning dances plus the Rio Samba that Elsa taught them during her time with the troupe. I was fortunate to attend the spectacular event that showcased the spirit of the town and witness the tremendous support of the young dancers, as well as chat to Rowan about the creation of the film. Called “Elsa and The Riel Dancers”, the idea of the film is to connect Elsa’s story of growing up in Cape Town and wanting to follow her dream of becoming a dancer, choreographer and teacher and experiencing some barriers due to the apartheid regime in place at the time. She immigrated to the UK in 1961 and was able to explore her creative potential. “Over the years she has supported many different projects in SA and the UK but her great love is dancing so it seems fitting that she tries to help the Riel Project,” said Rowan. “We are making the film to highlight their need for sponsorship and also to showcase their raw talent. We also wanted to show the young dancers that they too have ambitions and aspirations to succeed in life if given the chance. We were totally blown away by their story of how they against all odds managed to win the World Traditional Dance Championships against 63 competing countries. “From our perspective, we are going to try and tell the story of the children that make up Die Nuwe Gaskoue Trappers. In the film we focused on four of the dancers,” explained Rowan. “Marcelino, aged 17 is a tall, limber guy that is equally good at the Riel, the Riel Tap Dance, and now the Samba which Elsa taught the group while in Clanwilliam. Although very gifted, he says he will most probably be a farmer, but he tends to come alive in the dance sequences. Marcellino told us when we asked him if he won any sponsorships, when they competed in Los Angeles in 2015, he said no he didn’t because he wasn’t a featured dancer at the time, but in his words ‘He would grab it with both hands if offered one’. With the film, Rowan hopes to expand the visibility of the Riel Dancers, improve their circumstances and attract sponsors to provide financial and upliftment support. “Not all the riel dancers will follow a career in dancing and they all seem to dance for different reasons. However, these young people truly come alive in dance and have so much potential but lack the necessary resources to progress from their circumstances. One wonders if given the chance to shine what they would achieve. “I’m hoping to find business people in SA and the UK who will sponsor the children’s education. We would like to appeal to any organisations that have upliftment programmes to get involved, especially those interested in empowering young women. “We believe that that education could help them make better life choices in the long run, and may prevent a life time of hardship. At the moment we are focusing on getting them through school, and then looking for some tertiary opportunities,” says Rowan. Some ways businesses and individuals can assist Die Nuwe GrasKoue Trappers include hiring the dance troupe them to do a performance for a business event – they are a big group and come with the band; sponsor one of the dancers’ education/uniform/books; or get in touch with Floris about any local dance competitions or performance opportunities. When I found about Die Nuwe GasKoue Trappers I was struck by how a group of untrained teenage dancers took the world by storm winning in Los Angeles in 2015. In our interview with Floris for the film we asked him if much has changed since them winning and he said he felt that the kids had become more confident in themselves. For more information about Die Nuwe GrasKoue Trappers please contact Floris Smith – floris@florisrestaurant.co.za / 027 482 2896. If you wish to follow their incredible journey, the dance troupe has is on Facebook and Instagram. 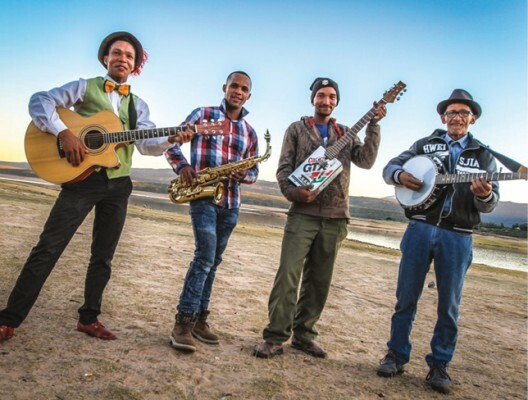 Much more than just music and dancing, the Riel Dance encompasses an entire cultural world that spans the Northern Cape, Western Cape, Karoo and some other regions. It represents a way of life with all its customs and traditions, and is a rhythm-and-dance language all of its own. Its roots can be traced all the way back to the Khoisan, the original inhabitants of much of today’s racial and tribal melting-pot of Southern Africa. The riel originated around the campfires of the Khoisan and Nama after the return of their hunters, after good harvests or during celebrations. The Nama name for the dance, Ikhapara, was derived from the word khapas which means “hat”, and the hat of a man was considered a useful article with which to court a woman for her hand in marriage. Hence the dance also became a dance of love and gave rise to many of the dance moves still seen today, while hats still form an integral part of the costumes of male dancers. As the original Khoi and San languages increasingly disappeared over time, and the influences of Western culture spread across the sub-continent, the name Ikhapara became less used and was replaced by the word riel. The name was borrowed from the word “reel”, a Scottish folk dance, and adapted to the Afrikaans now mostly spoken by the descendants of the Khoisan and the Nama, the latter being the largest surviving sub-group of the Khoi. Over the years the Riel Dance was also adopted as the dance of farmworkers and sheep shearers in the Karoo, Namaqualand and other regions, elements of their daily life and activities being portrayed in some of the dances. Owing to the original campfire dancing venues in sandy, desert-like rural settings and the later venues on farms, the dance is today still largely practiced in sandy locations. Adding to the electrifying energy of the dance produced by the fast tempo music and the dance moves, is the kicking up of a veritable dust storm by the nimble-footed dancers. Many of the dances are still performed in a circular movement, just as they were by the ancient Khoisan around their campfires in the dusty veld. While the riel has survived in relative obscurity over the ages, it enjoyed much popularity among farm workers and other working class people of the Northern Cape, Western Cape and Karoo between the 1940s and early 1960s, after which it started fading away. But it has been placed firmly back on the national dance stage since 2006 with the assistance of the ATKV, with dance competitions and sponsorships. Thanks to their efforts, today the Riel Dance is again riding a wave of popularity in the regions of its inception and beyond, and is danced by people ranging from toddlers to pensioners. At recent dance competitions more than 80% of the dancers were under the age of 18, a welcome injection of youth that will ensure its survival.